Kitchen remodeling is a great first step in maximizing the investment in your home. Our home remodeling contractors know there are so many options and ideas out there. Let us help you start exploring them today! When the time comes for kitchen remodeling or kitchen renovation, you are going to want a home remodeling contractor that is focused on customer service. If you are taking the time and money for kitchen remodeling, you want to get exactly what it is you have been dreaming about. For that, you need an experienced designer that will transform your existing space into the one you have in mind. We are entirely dedicated to customer service. We achieve that be designing exactly what you want. You have an idea, and we have the ability to transform that idea into an elegant new room. 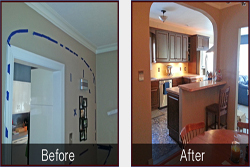 When we do kitchen remodeling, we give our clients just what they want. Share your idea with us right away to get the design process started. We are the best in the business at home remodeling. When we focus on kitchen remodeling, we make sure to give you just what you want. Some kitchens need to be entirely renovated, while others just need a slightly new look. We can guide your through the process and will make sure that the product we provide is the product you want. So, remodel to renovation, we’ve got your covered! Appliances and paint are easy places to start, but cabinets, counter tops and back splashes can have a much bigger effect. An entirely new tile floor might even be right for you. What is important to us is making sure that we present you with all the options, and then help you find the kitchen remodeling choices that are right for you. Come take a look at the options we have to offer! We are an experienced and licensed home remodeling contractor and you can be sure that you will get the best customer service in the business. Our design team is committed to making sure that your kitchen remodeling project is just right for you. When we focus on every little detail, we can get it all just the way you like. A big part of that is being hands-on with you throughout the entire project. Our owner is committed to communicating with you and understanding your needs. We are certain you will enjoy this process, so call us and get the ball rolling. When we do your custom kitchen remodeling, we know that you are an integral part of the design process. We hand draft the plan for your kitchen, and a full understanding of what you want is important for that. Our owner has more than thirty years’ experience, and will guide you through the custom design process. He takes tremendous pride in his work, because he knows you take the same pride from your home. Why not sit down with him today to see how he can turn your idea into a splendid new kitchen? 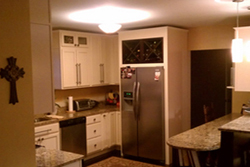 We do kitchen remodeling in Carmel, Fishers, Noblesville and surrounding areas.